Adu, a happy preteen boy lived with his family in Susa, a village located in the South of Ghana. His father was a kind and humble farmer while his mother was a hardworking housewife who sometimes helped her husband on the farm. They were very well cherished by all the villagers. However, in a matter of two months, Adu's life drastically had a turn of a hundred and eighty degrees as he tragically lost his whole family members. Following that, he was forced to moved in with his only aunt, who was uncaring and pitiless. He suffered so much in the hands of his aunt to the degree of wanting to put an end to his life. Fortunately, he failed as he remembered what a Christian friend once told him. "God is able to change even the worst situation to something better. Your father wants you to live, he wants you to live for him. His life is ended but yours is not"
"The pain in his body was at present as real as his hatred for his aunt. But he wanted to live". "Grief Child" is an inspirational story of a young boy incontinent with grief. Whose faith in Christianity helped him in overcoming obstacles after losing all of his family members. A well written novel that won the Commonwealth Writers Prize for best first book Africa in 1992. As most of you already know, count it part of my reading challenge. Please click here for more info. All the same, it was not a novel that I particularly enjoyed. A YA Christian fiction that I would recommend mostly to young people who are going through difficulties and are bereft of hope. I always say that staying with your immediate family is the best. There is no place like home. A good thing Adu chose life over death. Thumbs up Mary. Know what I love about you and your work? You don't need to enjoy the story, but you read anyway and write your review. That's called dedication. Keep it up!!! Karo, I read along because I had to, you know part of a challenge. All the same it was not that bad just not my cup of tea. I have my reservations about this book even though it won the Commonwealth Book Prize. I understand how you feel. it was actually very well received on geosireads. Yet, it is not all that. Grief Child is actually part of the reading literature for secondary or senior high students in Ghana. 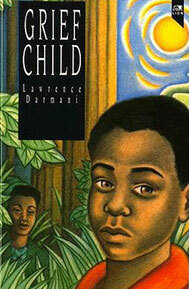 I have one at home, read by my first boy who is in SHS 2. I may just read it one of these day. seriously?? then I think you should. Would like to hear your opinion. It is in fact a quick read. I think it is a book worth reading right from the J.H.S. .My girl read it in primary 6 and enjoyed it. She asked so much questions and will not want to stay with another relative because of what Adu went through in the hands of his aunty. This book really deserve the award. you said it all, your girl.. I think it is a book that will do for young adults. Not a bad book actually. thanks for stopping by. Encouraging words for anyone to remember, surely. His life is not ended. I am so glad that this has been helpful. My kindest regards.